A hull identification number is a unique code, including a serial number, used by the boating industry to identify individual vessels. In 1972 the U.S. Federal government established the Hull Identification Number (HIN in this document), that is required for all boats manufactured or imported on or after November 1, 1972. Vessels manufactured or imported before this date are exempt from this requirement, when builder's identified boats ad hoc. The HIN is a 12 digit serial number that uniquely identifies a boat. It is analogous to a VIN on a motor vehicle registration. The HIN is normally used during the boat registration process and should be included on any bill of sale. The primary HIN must be permanently affixed or engraved on the hull on the starboard side of the transom within two inches of the top of the transom, gunwale, or hull/deck joint, whichever is lowest, so that it can be seen from outside the boat. To identify a boats hull number for registration purposes some states may require a pencil rubbing or tracing of the hull number. To create a pencil tracing, place a blank piece of paper on top of the number and rub a pencil across the paper so that an impression of the number appears. If the rubbing is not clearly legible write the numbers you see adjacent to the rubbing and take a digital photograph. Note: The HIN is not the same as a State registration number, which may be required to be displayed on the bow of your boat. In the USA the federal regulations prescribe the standard format of the 12 digits. The first three characters consist of the Manufacturers Index Code and should only be letters. The next five characters are the unique serial number assigned by the Manufacturer, and can be a series of letters and/or numbers with the exception of the letters O, I, and Q (they can be easily mistaken). The last four characters determine the model and certification year of the boat. Prior to August 1, 1984, the manufacturer had the option of expressing this in the form of a model year designation. Pearson Yachts used PEA to identify the manufacturer. Note: Cal-Pearson used code KDG for yachts built from 1986–2003. Pearson Yachts used the 5 digit Serial Number to specify the first 2 digits as a factory model code (Table 1), and the last 3 digits as the unique hull number. Note: This 3 digit hull number presents a problem for boat productions greater than 999. An example is the P26, where production reached 1,000 in 1975, causing the number to roll over. This resulted in the necessity to add 1,000 to the hull number from that year forward. 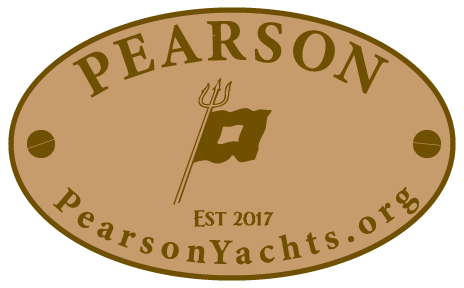 Pearson Yachts used the 4 digit Date of Certification to specify 2 digits as the year, 1 digit as month code (Table 2), and 1 digit that is yet undetermined. As you will note in the example the naming convention changed in 1984 so that the last two digits became the year – to conform to the change in HIN specifications. The Pearson production year runs from August of the previous year to July of the given year.